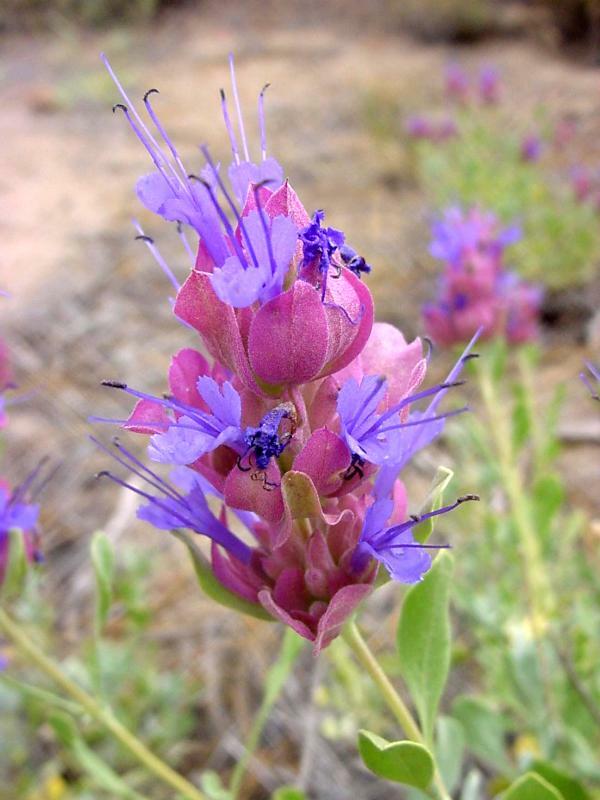 Rose or desert mountain sage is a prostrate to sprawling perennial shrub growing to about 3' tall. The oblanceolate to obovate leaves are from 2 to 5cm long and have ± entire, slightly wavy-margined leaves on petioles 5-15mm long. The inflorescence is a series of whorls crowded on a dense spike 20-50mm wide and up to 15cm long. The obovate to oblong bracts are papery, greenish to purple and/or rose, and rounded to truncate at the apices. The calyx of each individual flower is 9-12mm long and similar in color to the bracts, while the corolla is comprised of a cylindrical tube 13-23mm long, an entire-margined upper lip which is 4-6mm long, and an erose lower lip about 1/3 the length of the tube, and is dark- to violet-blue in color. The stamens and style are well exserted. The fruit is a tan to brown nutlet. 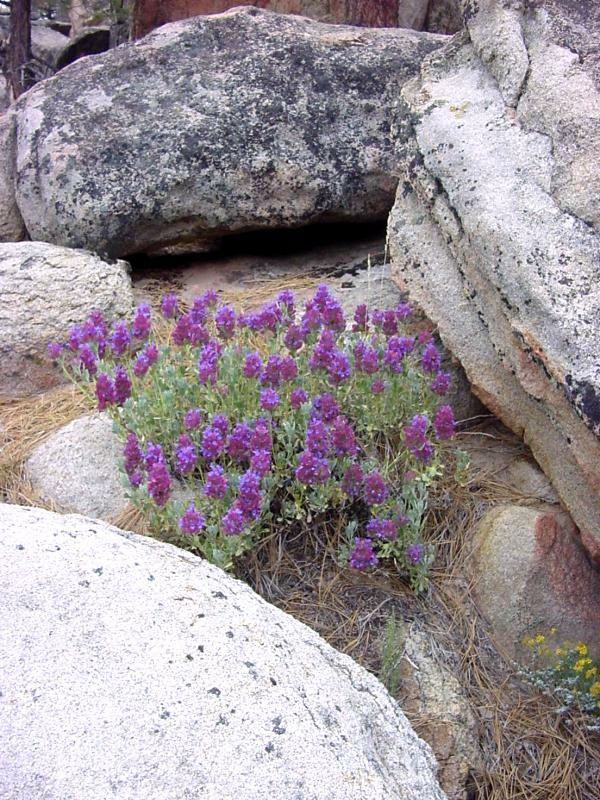 Rose sage occupies dryish rocky slopes in pinyon-juniper woodland to yellow pine forest from about 4000' to 8000' in elevation, and ranges from the San Bernardino Mts to the Panamint, Kingston, Clark and New York Mts and Baja, blooming from July to September. These pictures were taken in the San Bernardinos. 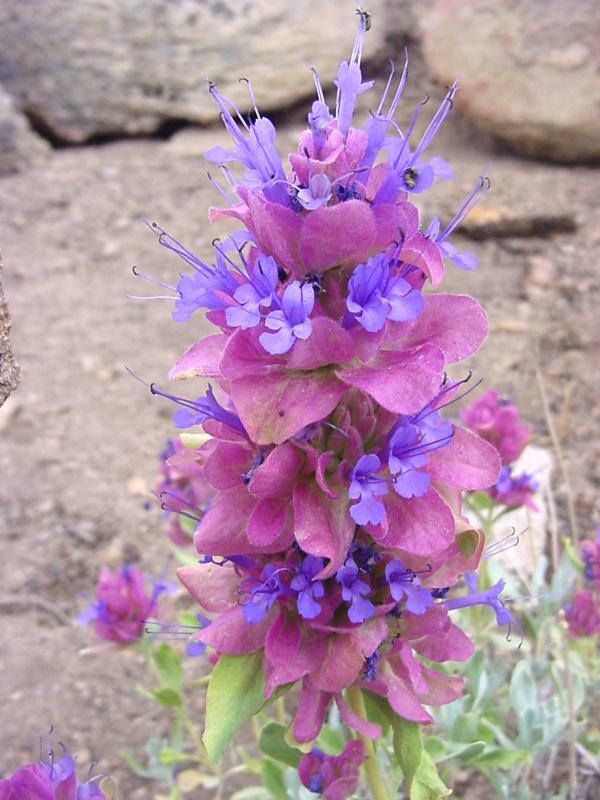 Click here for Latin name derivations: 1) Salvia 2) pachyphylla.